Michigan’s Legislature may be enjoying its final week of spring break before budget season begins in earnest, but the challenge of funding Michigan’s infrastructure continues to loom large. State House Speaker Lee Chatfield (R-Levering), Senate Majority Leader Mike Shirkey (R-Clarklake) and Democratic Gov. Gretchen Whitmer have each taken to the airwaves over the last few days on the issue. Republican-led Legislature in promising to reject any budget that doesn’t get to the $2.5 billion her administration says is needed to fix the state’s roads. She issued a stark warning: no summer break without a deal. Traditionally, Michigan’s Legislature is scheduled to be out of session for most of July and August. The governor said during her February State of the State address that she wanted the budget done before summer break, as her predecessor, GOP former Gov. Rick Snyder was able to accomplish with the help of a Republican Legislature. This week, Whitmer seemed to acknowledge the process could take longer. On the Michigan Big Show radio program Wednesday morning, Chatfield said that he’s open to continuing conversations with the governor — but that it’s not within her purview to decide when the legislative session begins and ends. However, under Michigan’s Constitution, Whitmer does have the ability to call a special legislative session. 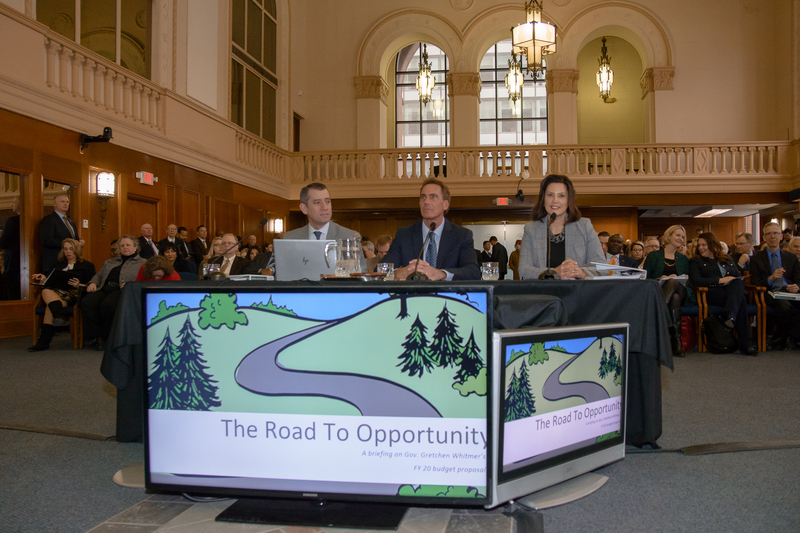 Whitmer introduced her road funding plan last month, calling for an incremental gas tax hike of 45 cents in order to raise $2.5 billion for roads and bridges, while increasing the state’s Earned Income Tax Credit. The plan also would repeal the so-called pension tax and raise taxes on some small businesses. Both Chatfield and Shirkey have opposed Whitmer’s proposed gas tax hike, saying that Michigan residents can’t afford the hit to their pocketbooks. A recent report from national transportation consulting firm TRIP, however, determined that the sorry state of Michigan’s roads and bridges costs drivers in the state about $14 billion annually. At the same time that Whitmer and GOP leaders debate road funding, there’s also some discrepancy between budget experts over just how much money the governor’s plan actually raises for roads, as the Advance has previously reported. Officials with the nonpartisan House and Senate fiscal agencies say the plan would raise gas taxes to the tune of $2.5 billion, but only bring in $1.9 billion for roads because of budget shifts. Meanwhile, officials with the Department of Technology Management and Budget (DTMB) say the $2.5 billion would be all new revenue that could go toward road repairs. In separate appearances on the Michigan Big Show program, both Shirkey and Chatfield have said that their Republican caucuses are working on their own road funding plans. On the MIRS podcast, Whitmer said that the various elements of her proposed budget are “absolutely interlinked,” and that the state’s ability to fund education, drinking water infrastructure and road repairs are all tied together. “I’m not signing anything unless it’s all done together,” Whitmer said. While Whitmer’s proposed gas tax increase is at the core of her budget, no legislation has yet to be introduced that would do that — and it’s unclear when a theoretical bill would be ready. Senate Democratic spokeswoman Rosie Jones said that those conversations will likely accelerate once legislators return from spring break next week. Whitmer’s ultimatum renews the question of whether a shutdown of the state government could be possible this fall, absent a deal. Michigan’s new fiscal year begins on Oct. 1. Without a balanced budget in place, parts of the state government would be forced to close until one is passed. Michigan had two short government shutdowns in 2007 and 2009 during the state’s decade-long recession, which drained revenue from state coffers. In both instances, the state had divided government, with a Democratic state House, GOP Senate and Democratic governor, Jennifer Granholm. Whitmer and Chatfield have both said they hope to avoid that scenario. “I’m not too worried about it. I think it’s something that will get worked out,” Chatfield said. “We’ve all been in this position before. I don’t think anyone wants to see the old days of Gov. Granholm and government shutdowns. Shirkey, for his part, says he intends to deliver a budget counterproposal to Whitmer’s desk by the early part of the summer. “We, being the Legislature, will present a budget to the governor by, I’ll say, the early half of June,” Shirkey said Tuesday. A fee schedule for medical, professional services, pharmaceuticals, medical devices and attendant care. Works for Workers Compensation. Replace “file in use” with “prior approval” for rate increases. Use driving record only for setting rates. Make insurance companies subject to anti trust and FOIA. Doing that would cancel the need for a MCCA fee increase and, as has happened in the past, result in a fee refund to policyholders. More will be gained over time as the above changes are put in place.